We’ve all been there- you’re midway through a road-trip when the urge to go to the bathroom comes upon you. Hundreds of kilometres from the closest township, you curse yourself for having that coffee in the last place you visited. The road is a straight stretch, there are hardly any trees in sight, and the next nearest town is who knows where, and definitely off the main path you’re following. Having said that, you don’t even know whether the next town will even have public restrooms where you can go to relieve yourself. It’s a situation that many of us have faced, and, as travelling domestically becomes even more popular, will continue to plague us. Some people may not stress too much about this issue, especially males, who can easily pull the car over to the side of the road and go behind the nearest tree. Without intending to sound sexist, it’s not as easy for womenfolk, children, the elderly or the disabled, although it certainly is possible. But wouldn’t it be easier if there was some way of knowing what the toilet situation in the nearest town might be? Luckily, the clever people at Explore Australia have thought this one through, and provided us with the perfect book solution. 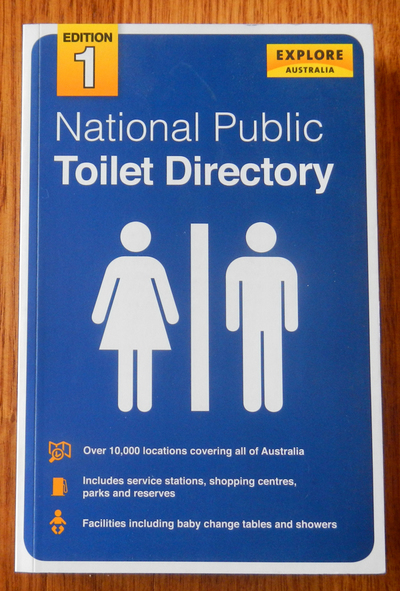 The National Public Toilet Directory is a handy guide which provides its users with all the necessary information they might need when looking for a public restroom in Australia. Covering over 10,000 locations, and listing facilities such as baby change tables and showers, as well as sanitary disposal, sharps disposal and drinking water facilities, this book would be a useful addition to any car trip. Organised by state and territory, and then by town name, there are even address details and opening hours listed. However (and this is quite unfortunate), the book neglects to mention whether there are disabled toilet amenities at each of the addresses, which could make things a little bit trickier for those with accessibility issues. All of the entries in this book were accurate at time of printing, so it is more than likely that most of the addresses will still be relevant today. If they’re not, you can always move on to the next address in the list, for the town you’re in. Regardless, you’ll still be better off with this book than having no guide at all! Very timely, with lots of people going away for the Easter long weekend. It sounds like a useful book.